Tilray, Inc. (TLRY) is confirmed to report earnings at approximately 4:05 PM ET on Monday, March 18, 2019. The consensus estimate is for a loss of $0.15 per share on revenue of $17.69 million and the Earnings Whisper ® number is ($0.12) per share. Investor sentiment going into the company's earnings release has 54% expecting an earnings beat. The stock has drifted lower by 31.3% from its open following the earnings release. Overall earnings estimates have been revised lower since the company's last earnings release. On Thursday, March 7, 2019 there was some notable buying of 5,062 contracts of the $70.00 call expiring on Thursday, April 18, 2019. Option traders are pricing in a 11.3% move on earnings and the stock has averaged a 14.5% move in recent quarters. 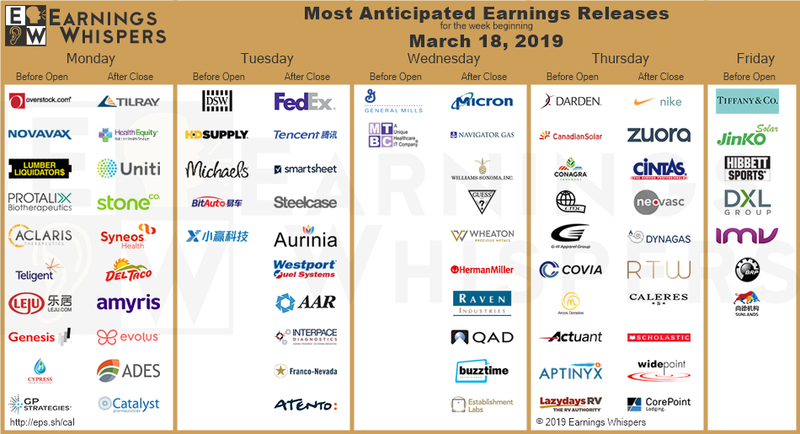 Micron Technology, Inc. (MU) is confirmed to report earnings at approximately 4:00 PM ET on Wednesday, March 20, 2019. The consensus earnings estimate is $1.67 per share on revenue of $5.97 billion and the Earnings Whisper ® number is $1.62 per share. Investor sentiment going into the company's earnings release has 45% expecting an earnings beat The company's guidance was for earnings of $1.65 to $1.85 per share. Consensus estimates are for earnings to decline year-over-year by 40.36% with revenue decreasing by 18.79%. Short interest has increased by 5.4% since the company's last earnings release while the stock has drifted higher by 24.9% from its open following the earnings release to be 10.7% below its 200 day moving average of $44.27. Overall earnings estimates have been revised lower since the company's last earnings release. 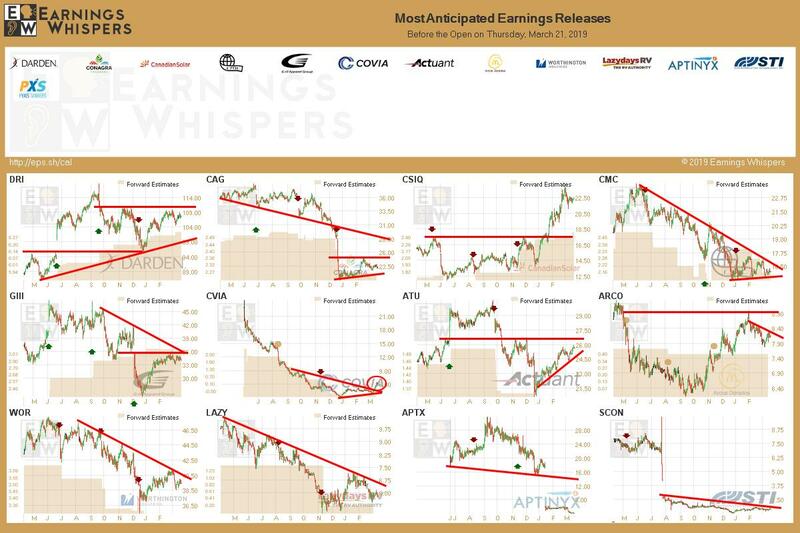 On Tuesday, March 12, 2019 there was some notable buying of 10,156 contracts of the $35.00 put expiring on Friday, March 22, 2019. Option traders are pricing in a 8.0% move on earnings and the stock has averaged a 5.4% move in recent quarters. 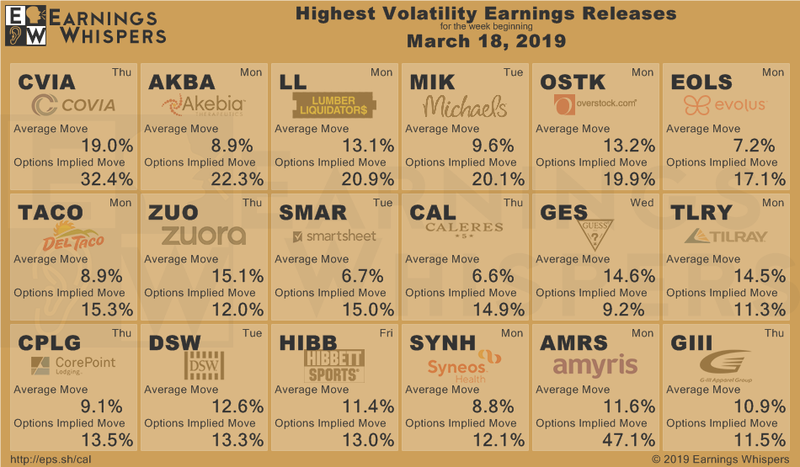 Overstock.com, Inc. (OSTK) is confirmed to report earnings at approximately 9:00 AM ET on Monday, March 18, 2019. The consensus estimate is for a loss of $0.67 per share on revenue of $483.67 million. Investor sentiment going into the company's earnings release has 57% expecting an earnings beat. Consensus estimates are for year-over-year earnings growth of 75.28% with revenue increasing by 6.00%. Short interest has increased by 67.4% since the company's last earnings release while the stock has drifted higher by 4.3% from its open following the earnings release to be 19.1% below its 200 day moving average of $25.26. Overall earnings estimates have been revised lower since the company's last earnings release. On Thursday, March 7, 2019 there was some notable buying of 3,691 contracts of the $25.00 call expiring on Thursday, April 18, 2019. Option traders are pricing in a 19.9% move on earnings and the stock has averaged a 13.2% move in recent quarters. Novavax, Inc. (NVAX) is confirmed to report earnings at approximately 7:30 AM ET on Monday, March 18, 2019. The consensus estimate is for a loss of $0.12 per share on revenue of $7.87 million and the Earnings Whisper ® number is ($0.13) per share. Investor sentiment going into the company's earnings release has 47% expecting an earnings beat. Consensus estimates are for year-over-year earnings growth of 25.00% with revenue decreasing by 24.41%. Short interest has increased by 26.7% since the company's last earnings release while the stock has drifted lower by 73.7% from its open following the earnings release to be 74.1% below its 200 day moving average of $1.97. Overall earnings estimates have been revised higher since the company's last earnings release. On Thursday, January 31, 2019 there was some notable buying of 36,277 contracts of the $2.00 put expiring on Thursday, April 18, 2019. 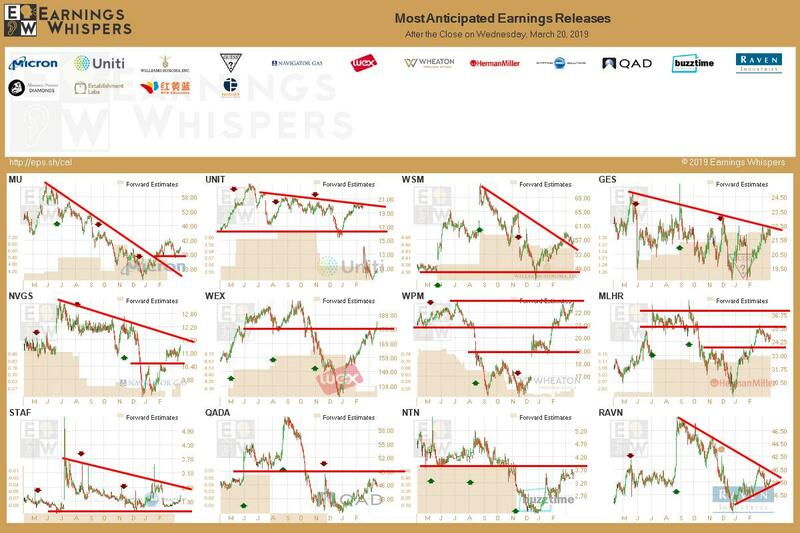 The stock has averaged a 7.6% move on earnings in recent quarters. Lumber Liquidators, Inc. (LL) is confirmed to report earnings at approximately 6:00 AM ET on Monday, March 18, 2019. The consensus earnings estimate is $0.16 per share on revenue of $273.15 million and the Earnings Whisper ® number is $0.11 per share. Investor sentiment going into the company's earnings release has 54% expecting an earnings beat. Consensus estimates are for year-over-year earnings growth of 60.00% with revenue increasing by 5.11%. Short interest has decreased by 7.8% since the company's last earnings release while the stock has drifted lower by 5.7% from its open following the earnings release to be 35.6% below its 200 day moving average of $15.80. Overall earnings estimates have been revised lower since the company's last earnings release. On Friday, March 15, 2019 there was some notable buying of 772 contracts of the $9.00 put expiring on Friday, March 22, 2019. Option traders are pricing in a 20.9% move on earnings and the stock has averaged a 13.1% move in recent quarters. FedEx Corp. (FDX) is confirmed to report earnings at approximately 4:00 PM ET on Tuesday, March 19, 2019. The consensus earnings estimate is $3.10 per share on revenue of $17.68 billion and the Earnings Whisper ® number is $3.13 per share. Investor sentiment going into the company's earnings release has 62% expecting an earnings beat. Consensus estimates are for earnings to decline year-over-year by 18.42% with revenue increasing by 6.98%. Short interest has decreased by 3.7% since the company's last earnings release while the stock has drifted higher by 5.2% from its open following the earnings release to be 17.5% below its 200 day moving average of $215.77. Overall earnings estimates have been revised lower since the company's last earnings release. On Thursday, March 7, 2019 there was some notable buying of 4,884 contracts of the $220.00 call expiring on Friday, July 19, 2019. Option traders are pricing in a 6.3% move on earnings and the stock has averaged a 4.5% move in recent quarters. Nike Inc (NKE) is confirmed to report earnings at approximately 4:15 PM ET on Thursday, March 21, 2019. The consensus earnings estimate is $0.62 per share on revenue of $9.50 billion and the Earnings Whisper ® number is $0.68 per share. Investor sentiment going into the company's earnings release has 74% expecting an earnings beat. Consensus estimates are for earnings to decline year-over-year by 8.82% with revenue increasing by 5.74%. Short interest has decreased by 25.0% since the company's last earnings release while the stock has drifted higher by 18.4% from its open following the earnings release to be 11.4% above its 200 day moving average of $77.92. Overall earnings estimates have been revised lower since the company's last earnings release. On Monday, March 4, 2019 there was some notable buying of 3,343 contracts of the $72.50 put expiring on Friday, June 21, 2019. Option traders are pricing in a 5.3% move on earnings and the stock has averaged a 4.0% move in recent quarters. 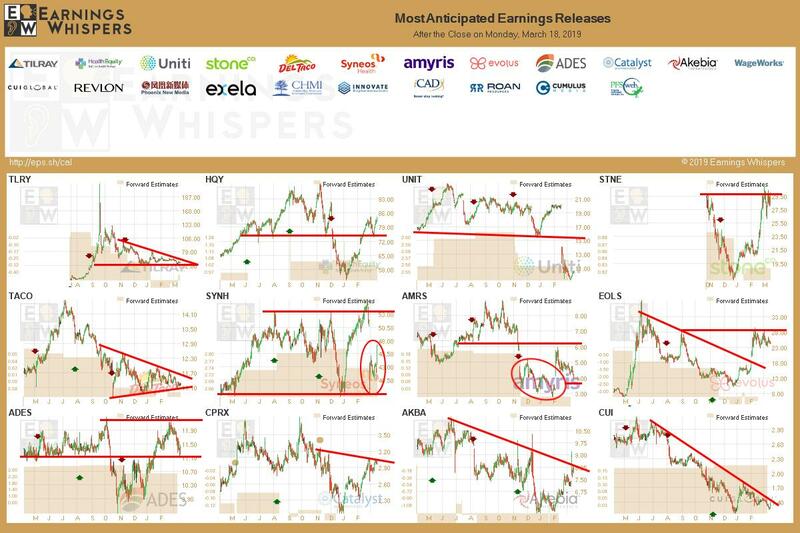 HealthEquity, Inc. (HQY) is confirmed to report earnings at approximately 4:00 PM ET on Monday, March 18, 2019. The consensus earnings estimate is $0.21 per share on revenue of $74.50 million and the Earnings Whisper ® number is $0.21 per share. Investor sentiment going into the company's earnings release has 61% expecting an earnings beat. Consensus estimates are for year-over-year earnings growth of 250.00% with revenue increasing by 23.27%. Short interest has increased by 45.6% since the company's last earnings release while the stock has drifted higher by 7.0% from its open following the earnings release to be 4.2% above its 200 day moving average of $78.87. Overall earnings estimates have been revised lower since the company's last earnings release. Option traders are pricing in a 7.8% move on earnings and the stock has averaged a 7.1% move in recent quarters. 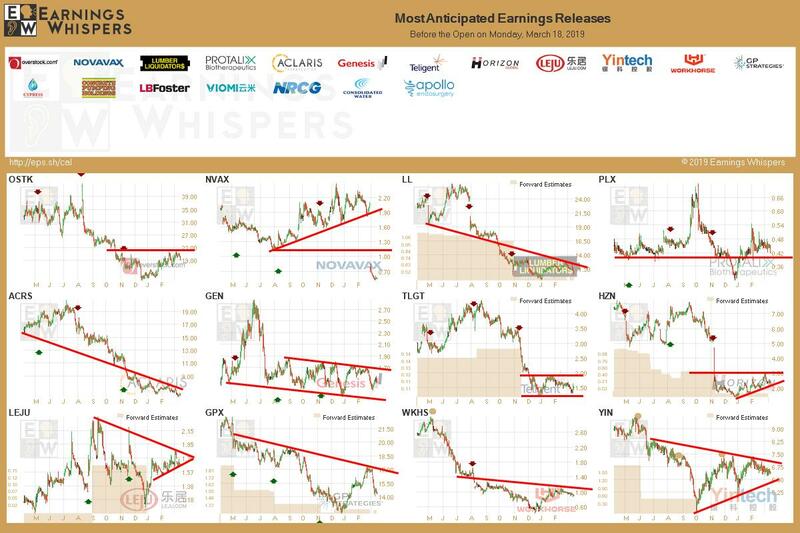 Protalix BioTherapeutics Inc (PLX) is confirmed to report earnings at approximately 7:00 AM ET on Monday, March 18, 2019. The consensus estimate is for a loss of $0.03 per share on revenue of $10.45 million. Investor sentiment going into the company's earnings release has 50% expecting an earnings beat. Consensus estimates are for year-over-year earnings growth of 70.00% with revenue increasing by 323.25%. Short interest has decreased by 15.5% since the company's last earnings release while the stock has drifted higher by 2.3% from its open following the earnings release to be 46.3% below its 200 day moving average of $0.91. 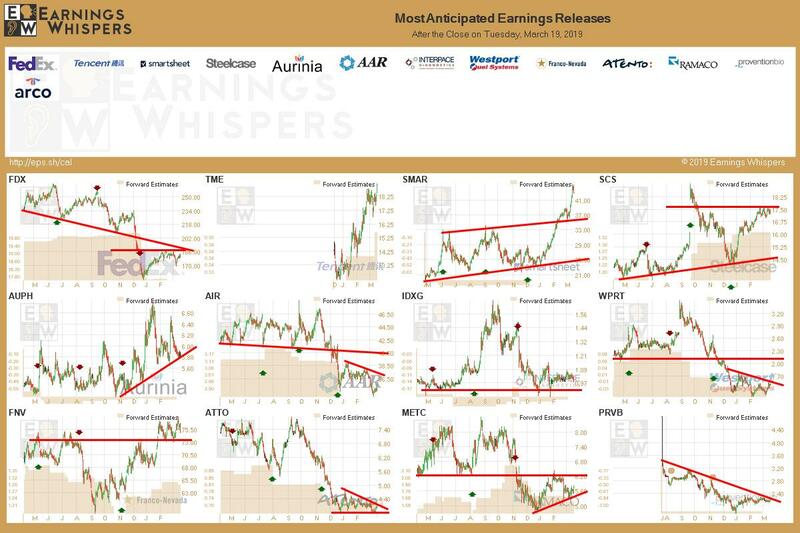 Overall earnings estimates have been revised higher since the company's last earnings release. The stock has averaged a 2.4% move on earnings in recent quarters. 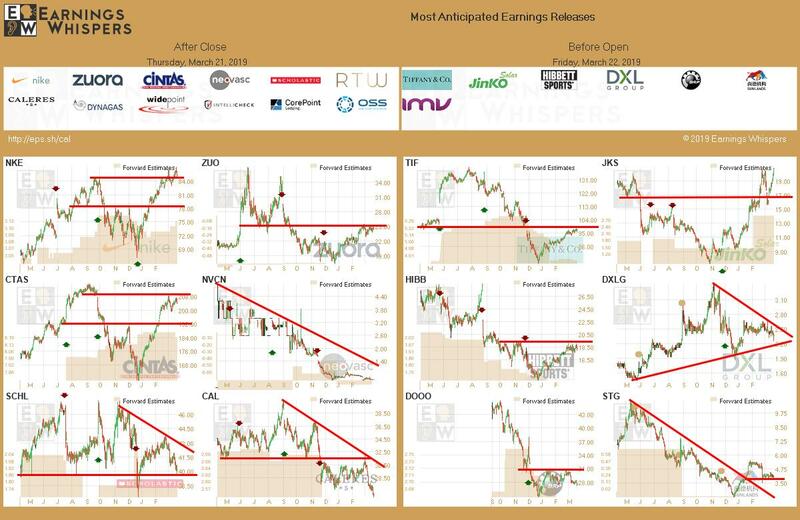 DSW Inc. (DSW) is confirmed to report earnings at approximately 7:00 AM ET on Tuesday, March 19, 2019. The consensus earnings estimate is $0.03 per share on revenue of $848.96 million and the Earnings Whisper ® number is $0.05 per share. Investor sentiment going into the company's earnings release has 67% expecting an earnings beat The company's guidance was for results to range from a loss of $0.09 per share to earnings of $0.06 per share. Consensus estimates are for earnings to decline year-over-year by 92.11% with revenue increasing by 17.92%. Short interest has decreased by 30.2% since the company's last earnings release while the stock has drifted lower by 5.1% from its open following the earnings release to be 7.2% below its 200 day moving average of $27.36. 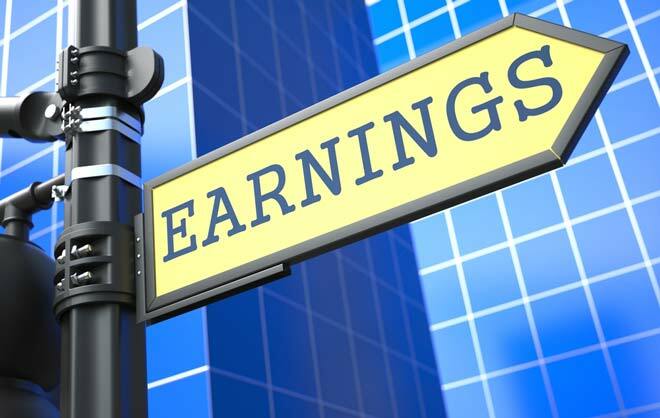 Overall earnings estimates have been revised higher since the company's last earnings release. Option traders are pricing in a 13.3% move on earnings and the stock has averaged a 12.6% move in recent quarters. 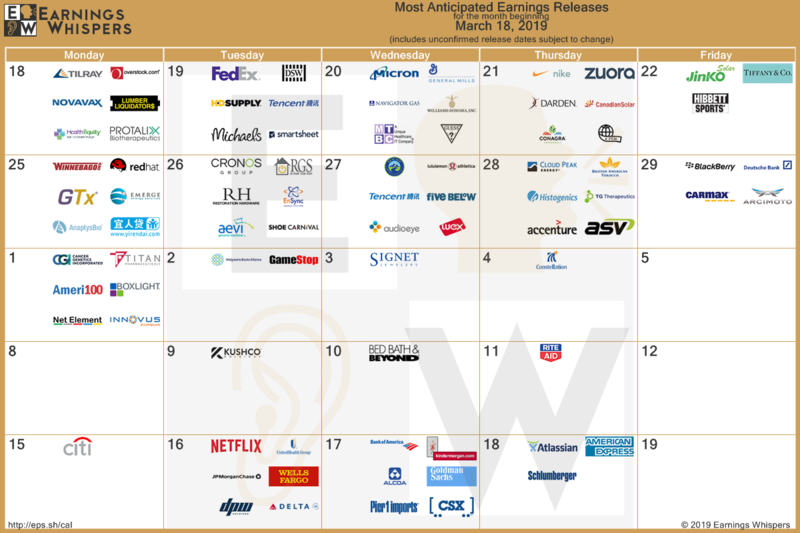 Here are the most anticipated Earnings Releases for this upcoming trading week ahead.